There are so many different oils out there right now and I've tried a few of them - argan, jojoba, grape seed, macadamia etc etc. I had tried another brand's argan oil before, and wasn't a fan, purely because I am not much of a fan of warm, sweet scents. It wasn't a good enough product for me to bare with the smell. 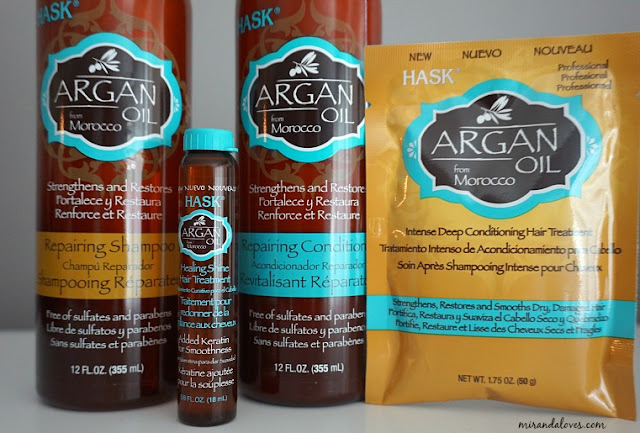 When I had the opportunity to try HASK Argan Oil products, I thought, what better way for me to give Argan oil another shot - and I'm glad I did! I don't regret this at all... Keep reading to find out why. To start, Argan Oil is a time-honored beauty secret in its native Morocco. It is loaded with vitamins and oxidants and works to repair, strengthen and moisturize your hair with continued use. It also acts as an agent to help you tame any fly-aways, frizz and adds shine to your hair as well. 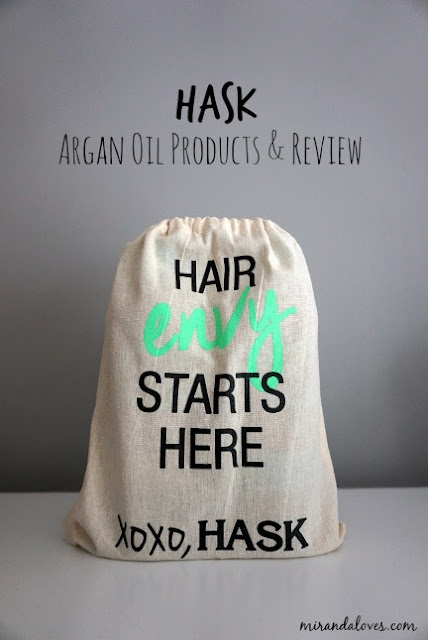 ...everything was packed in a really cute HASK Hair Envy drawstring bag (perfect for on the go)! Revive and restore the look of your hair with HASK Argan Oil Repairing Shampoo. Infused with moisturizing argan oil, this shampoo penetrates the hair shaft, gently cleansing while it repairs damage and breakage, leaving even the most rebellious hair frizz-free, silky-soft and super glossy. Ideal for dry, damaged or color-treated hair. I loved this product. 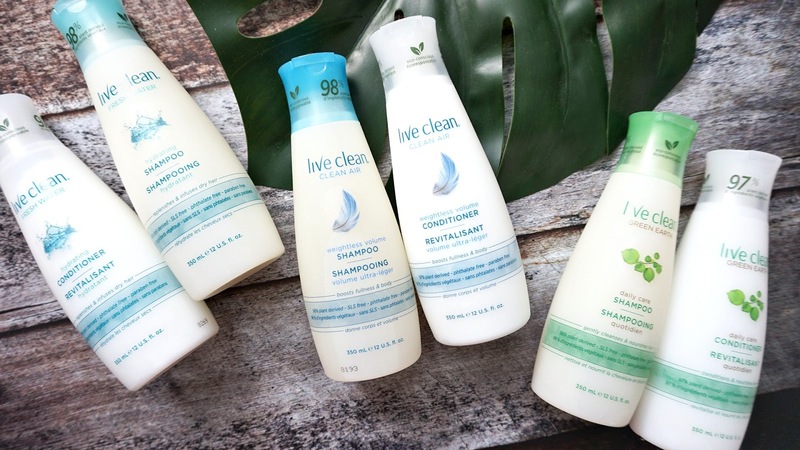 A little goes a long way - it works to a good lather and cleanses your hair thoroughly. It has a slightly citrus scent (love it - it reminds me of really sweet and crisp clementines for some reason... I cant really put my finger on it). My hair is left really clean, but not weighed down by the oil in the product. Revive and restore the look of your hair with HASK Argan Oil Repairing Conditioner. 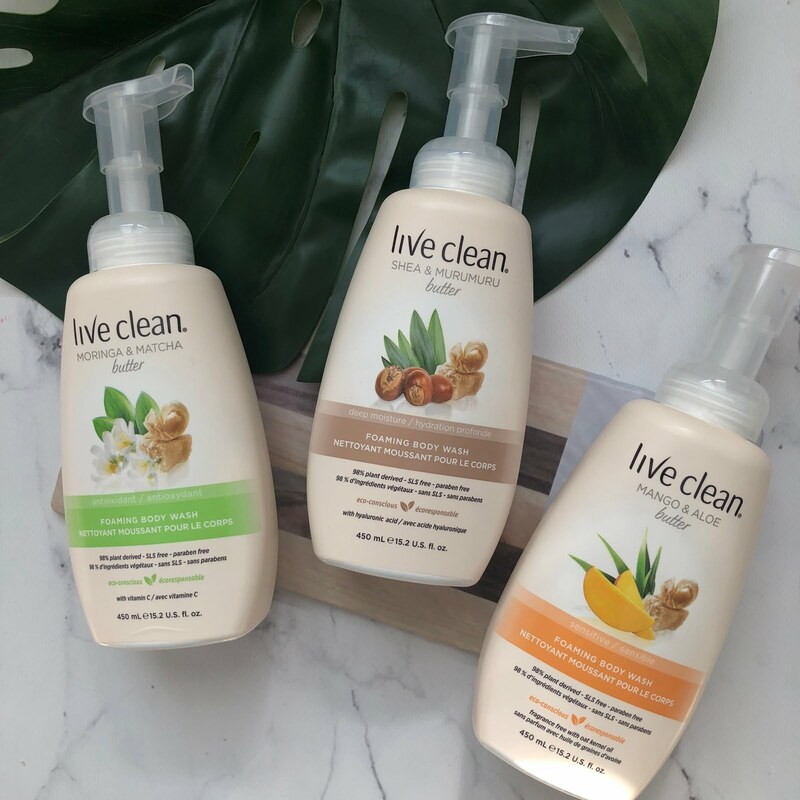 Infused with moisturizing argan oil, this conditioner penetrates the hair shaft, gently softening and detangling while protecting against damage and breakage, leaving even the most rebellious hair frizz-free, silky-soft and super glossy. Ideal for dry, damaged or color-treated hair. You have to use about double this amount (as you did for the shampoo) to get a deep hydrating feeling. Once again, the scent is the same, and it doesn't weigh down your hair. At first when you apply it, you aren't quite sure if it's working because it doesn't have that slippery conditioner feeling. However, don't be fooled and put too much in. When you rinse your hair off after letting it sit for 1-2 minutes, you feel that slippery-ness you come to know through years of using various different types of conditioner. 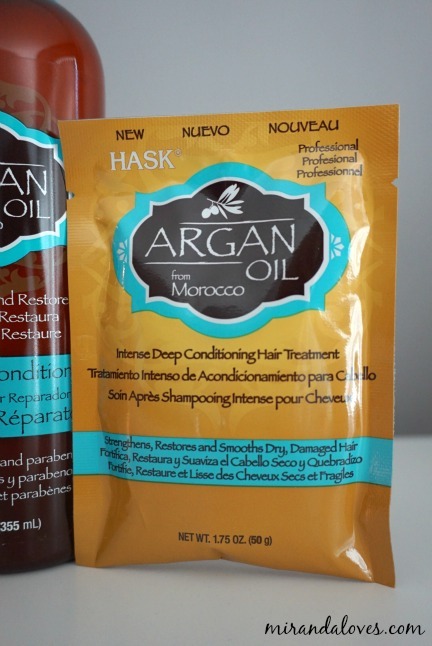 HASK Argan Oil Repairing Deep Conditioner, is a super strengthening, hydrating treatment that will restore and smooth dry, damaged, chemically treated or over processed hair. Argan oil, unique to Morocco, is known for its high absorbing, penetrating and split end qualities while leaving even the most damaged hair soft and nourished for added moisture. 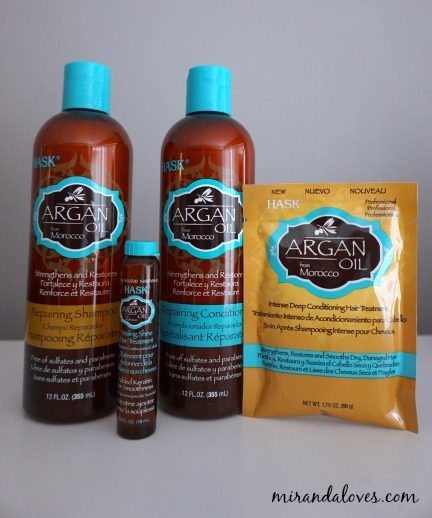 Directions: Apply a generous amount of Argan Oil Repairing Deep Conditioner to clean, wet hair. Massage into hair focusing on damaged areas. Let penetrate for 10 minutes. Rinse well. Style as usual. LOVE! I need this in bulk now. Possibly my favorite product of the line. Even if I don't let it sit for 10 minutes, I still get really good results in about 5-6 minutes. This lightweight, alcohol-free oil absorbs instantly to provide frizz-free shine without leaving an oily residue. Argan oil is rich in essential fatty acids and penetrates hair to restore shine and provide soft, silky results in dry, damaged hair. Directions: Can be used on both wet and dry hair to create a silky, smooth finish. Apply a coin-sized amount evenly throughout hair, avoiding the root area. Style as desired. Really good at giving you a silky shine finish without weighing down your hair or making your freshly washed hair look like second day hair. However, I found that with about a week's use of the Argan Oil Shampoo + Conditioner, I really had no use for the Shine Treatment. This might be because of my fine hair. After trying out this line, I must say I am a converted woman and now love Argan Oil products (well, only from HASK for now) - What are your thoughts on oil-infused products? What do you use? Would love to hear your thoughts!